The Maxtor? OneTouch? 4 Lite solution is a full-featured backup and storage solution with Maxtor SafetyDrill? for complete recovery of a hard drive¡¯s contents in case of a system crash or virus/spyware attack*. With two levels of data security and capacities up to 1 TB, users can confidently back up or sync work and home computers. Protect your data from unauthorized use. 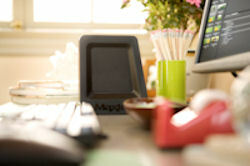 Provide a safe haven for your entire working environment. Don¡¯t back up and protect just your files anymore. System crashes and virus attacks can happen, and it¡¯s difficult to get your computer back to just the way you like it. To prepare, should the unfortunate happen, Maxtor SafetyDrill automatically creates a snapshot of the entire contents of your PC¡¯s hard drive which can be readily booted for an easy and complete recovery. Backup all your precious memories to one safe, convenient place with one touch of the button or automatically with easy scheduling software. Maxtor¡¯s simple user interface makes it easy to protect your contents without even thinking about it and, just as importantly, restore it if needed. With this elegantly simple full-featured backup solution, Maxtor¡¯s software makes automated backup scheduling, specific file restoration, sync, security, drive and power management a snap. To safeguard against unauthorized use, Maxtor OneTouch 4 Lite comes with both data encryption and Maxtor DrivePass. It¡¯s simple to install ¨C just plug the external drive into an available USB 2.0/1.1 port on your PC or Mac. With up to 1 TB, there¡¯s ample room for your important documents, videos, photos, graphics, and music in one safe, convenient location ¨C over 16,660 hours of digital music or 320,000 digital photos or 1000 hours of digital video or 250 two-hour DVD quality movies or 500 games. The sleek and slim design of this hard drive--only measures 6.73 x 2.49 x 5.88-inches (H x D x W). The Maxtor OneTouch 4 Lite lets you transfer files seamlessly from your computer via its USB 2.0 connection at a brisk transfer rate of up to 480Mb/sec. The drive delivers a spindle speed of 7,200 RPM, giving you the high-speed performance you need to back your data up quickly and safely. At this compact size, and with this high performance, you now have the ability to take your data with you anywhere you go, so your digital content finally has room to breathe. A five-year warranty is also included, giving you complete peace of mind. ¡¤	Maxtor? SafetyDrill? prepares, boots and recovers a PC¡¯s entire internal drive contents in case of system failure or virus/spyware infection. * ¡¤	Back up all your files with one touch of the button or automated scheduling. ¡¤	Plug and play storage ¡¤	Auto Updater helps keep your Maxtor OneTouch solution current. Maxtor? is the expert and the leader in designing simple external storage and backup solutions for consumers and professionals. Maxtor offers a broad line of trusted, intuitive storage solutions for safeguarding critical business data, digital files and personal memories. Maxtor developed the industry¡¯s first external storage device that features easy-to-use OneTouch? button backup and restore capabilities. The Maxtor? OneTouch 4 Lite solution is the easy way to back up and store photos, videos, games, music, business data, personal information and more. The OneTouch 4 Lite solution continues the OneTouch legacy as the leading external hard drive for small office users, consumers, creative professionals and mobile warriors. 1. One of the machines I'm backing up only has USB 1.0, and unless you can connect with a 2.0 port, it is really slow to transfer. It took all day to move like 20 gigs of photos. 2. Several times while backing up MP3s, it would just randomly error on a file, saying there was an error transferring it. Sometimes the file would be on the backup disk after the error, sometimes not. This issue may be related to #1. 3. There a whole file system already on the disk. I was expecting an empty drive (at least by appearance) such as you'd have if you installed a slave drive. I have to tell other family members to be extremely careful to only access the subfolders I've set up for them. I've owned this hunk of junk for 6 months and it died on me after moving it from one desk to another. First off, the thing never worked that great to begin with. Booting up my system with the HD plugged in would prolong the process by several minutes (feels like an eternity when you're just watching the screen and waiting). Then, every once and a while, none of the files stored on the thing would work with the appropriate program. PDF files would fail to open, saying the files were corrupted. WMV files would say they weren't compatible with Windows Media Player. I'd have to unplug and then replug the HD in order to correct that problem. Finally, it died on me on a business trip. I set up the laptop on a table, used the drive just fine, decided to move to a different table, and it never worked again. This thing was never dropped, bumped, or even turned upside down. It just completely conked out on me. After reading positive reviews on the Maxtor One Touch series disk drives in computer magazines and knowing Maxtor's long success of drive manufacturing I bought the Maxtor 500 GB One Touch 4 at a retailer. After six weeks of problem free operation the drive suddenly failed. It stopped spinning the disk. Eight hundred hours of my work downloading 1,700 songs and copying 57 movies were lost. I was furious. Maxtor told me the five year warranty (plainly stamped on the retail box) applies only to the hardware. If I want the data recovered Maxtor can attempt to recover it for a minimum fee of $1,000! I said absolutely not. First, in 26 years of using computers I have never witnessed any a hard disk drive to fail like this so quickly. Maxtor has a major quality control problem. 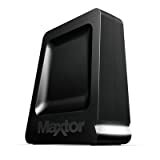 Second, that Maxtor claims a five year warranty on the outside of the box as a means to solicit purchase of its disk drive when this outer box fails to plainly state that this warranty applies only to hardware and not data violates 15 U.S.C. ¡ì52 (Dissemination of false advertisements) of the Federal Trade Commission Act. The specific terms of the warranty can only be found AFTER purchasing the disk drive and opening the box. Third, that Maxtor absolves itself of responsibilty for data lost on a hard disk drive that Maxtor warrants against failure for five years is unethical as the failure of its warrantied hardware caused the loss of the data. Maxtor ought to be obligated to recover data caused by the failure of its hard disk drive at no cost to the consumer. As an aside, I have lost data on Lexar Media flash memory cards that shorted out and they recovered my data and replaced the card at no charge. I picked this drive up at a retail store for $100 and was so amazed at the great price. 500 GB for this price was the best deal I'd seen. Could it be too good to be true? Longer answer: On the box it states it works with Macs. The software is compatible supposedly, but on start-up my new MacBook Core Duo started acting strange. So after trying to delete the contents of the drive I realized I couldn't. Great. Until I tried to copy files to it. It would work for ten minutes, then quit eventually crashing my computer. Finally it stopped showing up all together. I went to the forums (which are well hidden) on the official site to see if I'd done something wrong. There I saw page after page of the exact same issue, and many others far more severe if it would have worked. This drive is plagued alongside its counterparts as unreliable at best, and at worst, a great way to lose every digital file you love. I imagine that most people who've given this drive top marks haven't owned it long enough to realize its failings. That's the really insidious thing about it: the drive doesn't fail dramatically. It gives the illusion of working perfectly, and it's only when it's far too late that you realize that you've lost data. Let's not mince words: this is an absolutely unusable external drive. I didn't take much heed in the negative reviews that were there when I bought this unit - I'd had experience with Western Digital and Seagate external drives, a slew of brands of enclosures, and dozens of internal drives. I've not had many problems with Maxtor before, and I'd only had the best experiences with Seagate. I figured that an external hard drive controller would be a fairly easy thing to accomplish, if the off-brand imports were getting it down pat. 1. Large files seemingly randomly become wiped and appear as 0 bytes in size. 3. Directories and files become corrupt and inaccessible. 4. The drive fails to mount its partitions and requires cycling its power or rebooting to correct. These problems are not isolated occurrences - they are common enough so that virtually any task that requires an external hard drive is impossible to accomplish over any period of time. The other negative reviews here suggest that these are severe flaws inherent to the drive controller and that my drive is not just a lemon. Given this, I've no confidence that this drive can be "repaired." I have an external drive enclosure on order from Amazon. When it arrives, I will have to pry the casing open and extract the 500GB hard drive inside (these seems to be no easy way to do this without destroying the casing). This drive has a serious problem, but it seems maxtor/seagate do not care at all. I have been using it for about 4 days, when it has suddenly lost its partition table, meaning all of my data was gone - ALL of it. Searching through the tech support forum, i realized many others are experiencing the same behavior, and there are no replies by seagate. I tried to contact tech support, and had the pleasure of talking to the rudest, most non caring customer support agent. He basically blamed me for the problem, and just told me "reformat your drive". This drive is terrible. It crashed after using 2 months. I lost all my information, I have been using it for last 1 1/2 months. I used it last night, it works for while then the PC started acting wield and since then it keep saying to reformat drive. I would strongly recommend to get away from this device. Ran like a champ for 2 weeks. Then came up unreadable. I googled the problem - remove drive, reboot, reconnect. It found it but wouldn't read. Reboot - chkdsk found all manner of errors. Lost 75% of data. I was smart enough not to put anything irreplaceable on it. Junk design. I stored all my video files on this and haven't written to the disk since the initial load. But every few days I get errors about corrupted files and chkdsk recovers more and more lost data. How can this happen when data is only being read from the drive? This is absolutely worthless except for temporary storage of files you don't care if you lose.